Baritone William Sharp is a consummate artist possessing the rare combination of vocal beauty, sensitivity and charisma. Praised by the New York Times as a "sensitive and subtle singer" who is able to evoke "the special character of every song that he sings," Mr. Sharp has earned a reputation as a singer of great versatility and continues to garner critical acclaim for his work in concerts, recitals, operas and recordings. In the 2017-18 season, Mr. Sharp performed a program of Schoenberg and Eisler with the PostClassical Ensemble at the Washington National Cathedral, with a reprisal later in the season with the El Paso Symphony Orchestra. He joined the Bethlehem Bach Festival with performances of the Mass in B Minor, and Cantatas 21, 106 and 156. He returns to the Washington Cathedral with the PostClassical Ensemble in the 2018-19 season, in a concert entitled "I Sing the Body Electoral: Celebrating Walt Whitman". He then joins the South Dakota Symphony as soloist in a program of Dvořák, Gershwin and Ives. In the summer of 2017, William Sharp joined Brevard Festival in a recital of music by Weill and Schoenberg. Mr. Sharp’s recent engagements included a return to the Bethlehem Bach Festival for a series of Bach Cantatas and his Mass in B Minor; joining the Pacific Symphony Orchestra in works by Charles Ives; singing Bach’s Cantatas No. 32 and 49 with the Dryden Ensemble; and an evening of songs by John Musto with New York Festival of Song. His recent career highlights include singing as soloist with the Baltimore Symphony Orchestra, under Marin Alsop, in Copland’s “Old American Songs”; creating the role of Cosimo in the world premiere of John Musto’s The Inspector with Wolf Trap Opera to rave reviews; performing as soloist in the world premiere of “Amichai Songs” by David Froom for the River Concert Series (Maryland); and singing Bach, Bernstein, Britten and Paulus compositions with the Bach Choir of Bethlehem. Past highlights include a return to New York Festival of Song in a concert titled "Where We Came From"; "A Bernstein & Bolcom Celebration", also with New York Festival of Song; Bach Cantata 21, Mass in B Minor, and Paulus' A Dream of Time in a return to the Bethlehem Bach Festival; an appearance with Boston Early Music Festival in the modern world premiere of Graupner's Antiochus und Stratonica; return engagements to Caramoor, singing Schumann's Liederkreis with pianist Vladimir Feltsman, to New York Festival of Song in a program called "No Song is Safe from Us", and to the Bethlehem Bach Festival in St. Matthew Passion, Cantatas 198 and 74, also Mass in B Minor (with the Washington Bach Consort and Cathedral Choral Society, as well); singing as soloist in St. Matthew Passion with Music of the Baroque; and as soloist at the Washington National Cathedral in Handel's Messiah and Bach's St. John Passion. In Germany, with Deutsches Symphonie Orchester Berlin, he performed Scott Wheeler's The Palace at Four A. M.
Other successes include appearances as soloist with the National Philharmonic in Brahms's Requiem, with the New York Festival of Song in "Godmothers of Song," with the Cathedral Choral Society in Britten's War Requiem, with the Bethlehem Bach Festival in various cantatas and Bach's Christmas Oratorio, programs of Schubert songs and works by John Musto at the Caramoor Festival, the world premiere of Anthony Brandt's The Birth of Something in a return to Da Camera Society of Houston, Bach's St. John Passion with the Baldwin Wallace Bach Festival, return engagements at Tafelmusik, and a special presentation with the Vocal Arts Society at the Smithsonian Institute. 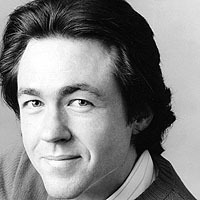 Other recent credits include John Adams's The Nixon Tapes with the Los Angeles Philharmonic, David del Tredici's Gay Life with the San Francisco Symphony, Chou En-Lai in Nixon in China with the Brooklyn Philharmonic, Four Saints in Three Acts with the Mark Morris Dance Group at the Brooklyn Academy of Music and at Cal Performances in Berkeley, and Purcell's Dido and Aeneas, also with the Mark Morris Dance Group. Overseas he has performed Sam in Trouble in Tahiti with VARA Radio in the Netherlands. Mr. Sharp's concert highlights include Britten's War Requiem with the Boston University Symphony at Symphony Hall, and with the Cincinnati Symphony Orchestra both in Cincinnati and at Carnegie Hall (James Conlon conducting). He has performed Mahler's Lieder eines fahrenden Gesellen with the Boston Philharmonic; works of Barber, Bernstein and Schickele with the Chamber Music Society of Lincoln Center; and in a gala performance celebrating the 15th Anniversary of the New York Festival of Song. He appeared with the Oregon Symphony in a program of Ives's songs, with the Boston Symphony Chamber Players in Boston and at Tanglewood singing Harbison's Words from Paterson, with Toronto's Tafelmusik performing works of Bach and Zelenka, and with the Fort Worth Symphony for Brahms' Ein deutsches Requiem. Other engagements include Bach's St. Matthew Passion on a national tour with Santa Fe Pro Musica and the Bach Mass in B Minor at Bryn Mawr University. He has appeared as soloist with the Da Camera Society of Houston for an evening of songs by Schumann, Brahms and Wolf, a program of songs by American composers, Schumann's Dichterliebe, and a program of songs by French composers entitled "Marcel Proust's Paris." Mr. Sharp has sung Handel's Messiah with Musica Sacra at Avery Fisher Hall and with the Vancouver Cantata Singers. William Sharp has appeared throughout the United States with major orchestras and music festivals. In recent seasons he has performed with the New York Philharmonic, St. Louis Symphony, San Francisco Symphony, National Symphony, New Jersey Symphony, and the St. Paul Chamber Orchestra. He is a frequent participant in Lincoln Center's Mostly Mozart Festival, Aspen Music Festival, Colorado Music Festival and the Marlboro Music Festival. Mr. Sharp also works extensively in the performance of baroque and pre-baroque music. He has made numerous appearances with the Bach Aria Group, the Handel and Haydn Society, and the Maryland Handel Festival. Mr. Sharp was nominated for a 1989 Grammy award for Best Classical Vocal Performance for his recording featuring the works of American composers such as Virgil Thomson and Lee Hoiby on the New World Records label. He can also be heard on the 1990 Grammy award-winning, world premiere recording of Leonard Bernstein's Arias and Barcarolles on the Koch International label. Other recordings include the songs of Marc Blitzstein with The New York Festival of Song (Koch), J.S. Bach solo cantatas with the American Bach Soloists (Koch), and in collaboration with soprano Judith Kaye and pianist Steven Blier on Gershwin's Songs and Duets. Mr. Sharp has also recorded for Vox-Turnabout, Newport Classics, Columbia Records, Nonesuch and CRI. William Sharp made his New York recital debut at the 92nd St. Y in 1983 and his Kennedy Center debut, followed by his Carnegie Hall recital debut, in 1989. The Carnegie debut earned critical praise including that of Bill Zakariasen of the Daily News, who wrote that Mr. Sharp's "musicianship is right on the button, his knowledge of styles seems infinite, and he has an infectious sense of humor." Mr. Sharp is the winner of the 1987 Carnegie Hall International American Music Competition. 07/2018 - PLEASE DESTROY ALL PREVIOUSLY DATED MATERIALS. ALL MODIFIED VERSIONS MUST BE APPROVED BY BARRETT ARTISTS.